I have written one review for every day of April, poetry month. Here, in alphabetical order by author, are selections for the second half of the month. 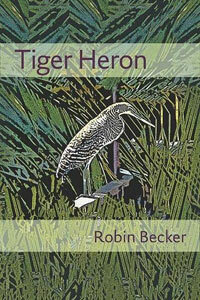 Robin Becker, Tiger Heron: Anyone living an ordinary life who has secretly believed her life deserves to be commemorated in poetry will embrace Robin Becker’s Tiger Heron. The casual pleasure of dogs and summer dinners and listening to Bach in the car—Becker transforms everything into language that is succinct, musical and richly imagistic. Frank X. Walker, Turn Me Loose: The Unghosting of Medgar Evers: “Turn me loose,” were the last words of Medgar Evers, the civil rights activist who was murdered by Byron de la Beckwith in 1963. For many Americans, Evers’ death is ancient history, but Walker adopts the voices of Evers’ enemies and loved ones to bring the outrage back to life. Franz Wright, F: Franz Wright’s 2004 Pulitzer Prize-winning volume Walking to Martha’s Vineyard was one of the best poetry books of the decade, so it feels wrong to complain that subsequent collections have failed to live up that marvelously inventive effort. Nevertheless, F, his latest, seems—despite some hard-edged successes—overwrought by comparison. Joan Naviyuk Kane, Hyperboreal: “Marraa qaġrut pulaarut qatigaakiŋun/Tuġusuilaq”: so read the opening lines of “Maliktuk,” written entirely in Inupiatun. Poems like this dot Joan Naviyuk Kane’s second collection, but the majority of the poetry is in English—spare, clear, sharp lines that effectively evoke the book’s “rim of the world” northern landscape. Pattiann Rogers, Holy Heathen Rhapsody: Pattiann Rogers has long been considered one of the best poets writing about science and the natural world, and Holy Heathen Rhapsody will not diminish her reputation. She writes with a field researcher’s close attention to detail, yet nearly every poem is also an attempt to connect with the transcendental. 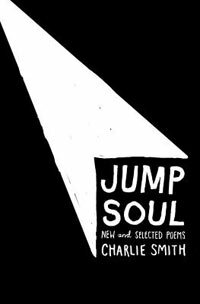 Charlie Smith, Jump Soul: New and Selected Poems: A Charlie Smith poem is like a word explosion–something detonates in the first line, then it’s impossible to tell where the debris will settle. Readers who love to be surprised by poetry will be delighted by Smith’s poems. Readers seeking order, harmony and common sense will be less enthralled. Medbh McGuckian, The High Caul Cap: This is a book about mothers and daughters, and a few of the countless variations to be found in that relationship, but readers shouldn’t expect warm and fuzzy. McGuckian’s pitch-perfect ear is paired with a sometimes surrealistic imagination. Sorrow plays a larger role than joy; memorable metaphors and similes abound. Stephen Dunn, Lines of Defense: Like Billy Collins, Stephen Dunn writes a colloquial, deceptively simple poem usually organized around a single conceit—“The Party to Which You Are Not Invited,” “Letter to the Man I Once Was.” Dunn’s poems, though, tend to be more philosophical, and despite their frequent comic turns, somehow sadder, more resigned. Luc Phinney, Compass: Even this late in the Age of Emotion, it still seems daring for a man to write frankly and tenderly about being a father. 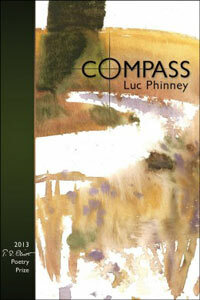 The central section of Luc Phinney’s Compass covers that territory with humor, pathos, and pluck, as “half giddy, half sick,” he watches his sons grow up. Benjamin Landry, Particle and Wave: The titles in Benjamin Landry’s Particle and Wave are elements in the periodic table—not the names, but the actual boxes, with the elements’ abbreviations, atomic numbers and electron configurations. The poems themselves are (to quote from “Dubnium”) “subtle // staccato or dithyrambic // bright crests performative neighbors.” Strange matter.